Verison 2 is on the way! Thanks to an outpouring of support on Kickstarter, we’re finally in a position where we can spend the money and time to roll out DIYLILCNC version 2. We’ll post periodic updates to show you all of the great ideas that make it (or don’t make it) through our unconventional approach to engineering. Keep in mind that all of the improvements you’ll see documented below are based on user requests. Trapped bearings: No more reliance on gravity-seating. Avoid specialty bearings where possible. 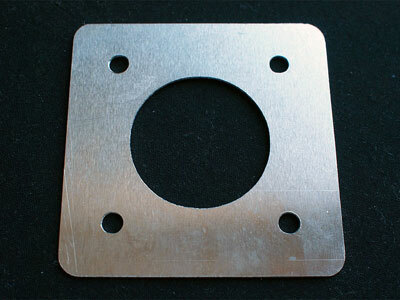 Metric parts: Hardware and sheet goods. 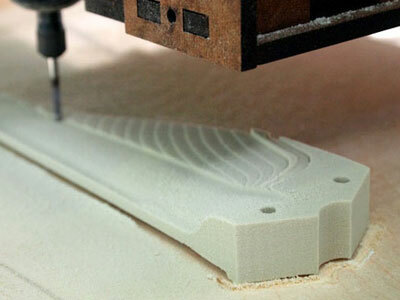 This means the new design will never rely on material thickness to enforce precise positioning of components. Scalability: Each axis should be easily lengthened without significant redesign. You asked for specifics, and we heard you! Here’s a growing listed of tested aspects of DIYLILCNC functionality. The unmodified design can easily cut inside a 2″ x 10″ x 10″ volume. This measurement leaves extra travel room for limit switches. One could easily expand the Y axis by lengthening rods, belts and the base. X and Z could be expanded as well, but this would require modifications to panel pieces in the CAD file. 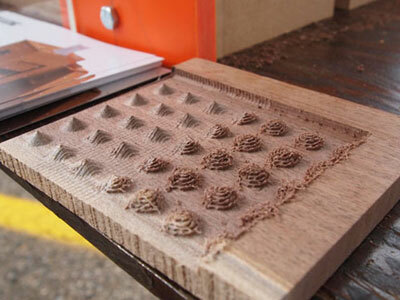 The lil’ CNC can travel at a top speed of about 100 inches per minute (ipm) in X and Y. Z travels more slowly due to gear ratios. Please note, however, that top-speed operation can lead to lost steps and/or material binding. The current design uses a cheapo Dremel tool rather than a fancy spindle. A standard Dremel accepts 1/8″ end mills. Though spindle speed can be adjusted, one must do so by hand, as opposed to controlling speed via EMC2. We picked the Dremel to keep our costs down, and you’d be surprised how well it can perform if you are careful with feeds, speeds, and bit geometry. Our design uses Masonite in lieu of more structural and expensive materials like aluminum or steel. Why? We’re trying to keep the price as low as possible. Cheap materials also lower the bar to experimentation – you can build this rig and push it till it breaks, then fabricate replacement parts quickly and cheaply with a laser cutter. We haven’t had this tested in a professional setting. Based on casual testing, we estimate that the device can readily repeat cuts within 1/100″. Which materials can it cut? Got a questions we didn’t answer here? Send us a request and we’ll add it as soon as we can. Steppers are great, but if you have poor cables you’ll spend all day troubleshooting connections. A nice set of polarized cables will help you spend all your time troubleshooting other things. Update from the “D’oh” files: Though I suggested in the post that you might be able to get away with undersized pins, I’ve since found that this type of connector depends more on the pins than the plastic housing to make a tight friction-mate. Make sure to purchase matching pin/socket and plug/receptacle components. *We sourced from MCM because we had other things to order there. You could probably find this stuff cheaper elsewhere, although I couldn’t find another source that will sell cut lengths of 24/6 cable. "Helping hands" are a must! Prep a length of multiconductor cable for each motor you plan to connect. I chose to make 3 x 4′ lengths. It’s a good idea to keep these wires on the short side so that they don’t add too much resistance to the circuit. Strip ~2″ of outer insulation from both ends of each multiconductor segment. 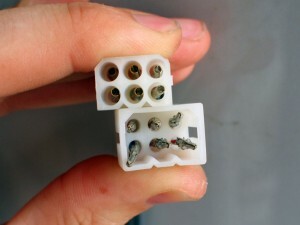 Next, strip ~1/4″ from each of the 6 individual conductors you find inside. 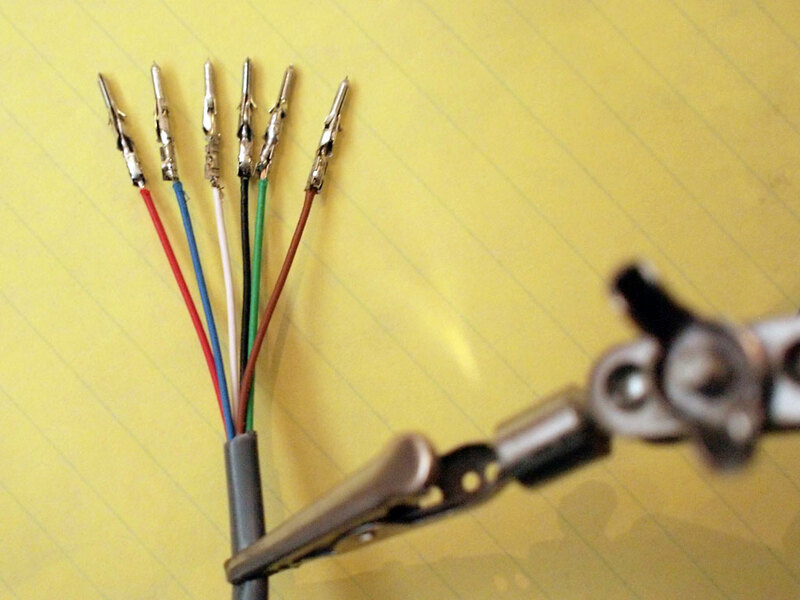 You should also twist and “tin” (pre-solder) the tips of these exposed conductors so that they’ll be easier to work with. Grab your bag of pins/sockets and solder one to every conductor, making sure to define one end of the cable segment as male and the other as female. You could probably get away with crimping, but I didn’t have the right tool in the shop. In Chicago we call that "Blagojevich crooked". 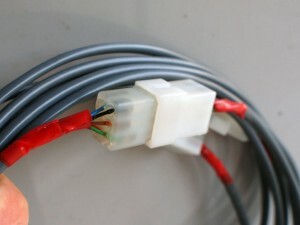 Stick the male pin wires into the back of the plug connector, then feed the female socket wires through the back of the receptacle connector. The gender assignment of the connectors is counter intuitive, so refer to the image above. Now take a look at the front of your plugs. You’ll note that the pins do no lock into place very well (especially if you ordered the wrong size pins like I did). To reinforce alignment, plug the two ends of your cable into one another. You should also check to make sure that your color coding is consistent: each color should connect to itself. Make sure that all pins are fully engaged with one another by looking at the plugs from the back. If a conductor is sticking out too far, you can push it back in with the edge of a jeweler’s screwdriver. Once you’re satisfied that the wires are all mating correctly, bend the conductors to one side at the back of the plug and squirt some hot glue into each conductor channel. Once the glue cools, twist the conductors and tape for added reinforcement. If you find that one of your pins is still positioned incorrectly, heat it up with the iron and reposition while the glue is warm. Repeat steps 1-3 for your 6 short lengths of cable. This time you’ll only be adding a plug or receptacle to one end of each length. Three of these cables will get soldered directly to your stepper motor wires (make these male). The other three will be connected to the motor outputs on your machine controller (make these female). If you did the genders right, you’ll be able to connect the short machine controller cable >> long cable >> short motor cable. I’ve seen some talk online about slightly more robust ethernet cables that come in 24 gauge. 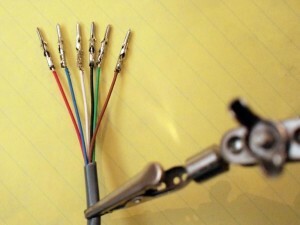 The standard cable is 22AWG, which is just one step away from the size recommended by hobbycnc.com. I’m still a little fuzzy on the math, but you might be able to get away with ethernet wiring for smaller motors. It would sure be convenient, plus there’s two extra conductors for a limit switch. Make sure you get stranded as opposed to solid core to avoid motion stress breakage. Let us know if this route works/burns down your garage.